The once mighty Habsburg Empire is disintegrating into a patchwork of new nations with overlapping borders. Yugoslavia has been proclaimed in the south, to combine southern Slav areas of the Empire with Serbia. The Czechs have declared their independence from Austria and now the Slovaks declare their independence from Hungary; the two kindred peoples hope to unite into a new state, Czechoslovakia. Meanwhile German-Austrians are talking about either establishing a republic for themselves or else uniting with Germany. Budapest has seen increasingly large and rowdy demonstrations by Hungarian nationalists seeking to sever the link with Austria. Blood has been spilled but Lukachich, commander of the city’s garrison is unable to restore order. So many of his troops have gone over to the rebels that he begs Emperor Karl to send him a contingent of loyal troops. However, the Emperor demurs; “enough blood has been spilt,” he says. Wekerle, the Hungarian Prime Minister, resigns and is replaced by Károlyi, the nationalists’ leader. Lukachich is placed under arrest. The changing of the guard in Budapest allows old scores to be settled. Tisza, the Hungarian prime minister in 1914 when Austria-Hungary went to war, has already survived two assassination attempts. Tonight his luck runs out as armed soldiers burst into his city residence. Blaming him for the war in which millions have died, they shoot him down in front of his wife and niece. For all the chaos within its borders, Austria-Hungary is still at war with the Allies, but the war may not have much time left to run. Emperor Karl has already requested an armistice of the Italians and now they receive his negotiators at Padua to work out the details of the end to hostilities. Meanwhile in Paris representatives of the USA, Britain, France and Italy meet and agree that once Austria-Hungary drops out of the war the Italians should occupy the territories on the Dalmatian coast assigned to them by the Treaty of London. As the Austro-Hungarians retreat to the pre-war frontier Italian troops race to recover lost territory. Italian troops advancing from the Piave today recover Vittorio Veneto; later advance troops make it all the way to the Livenza river. 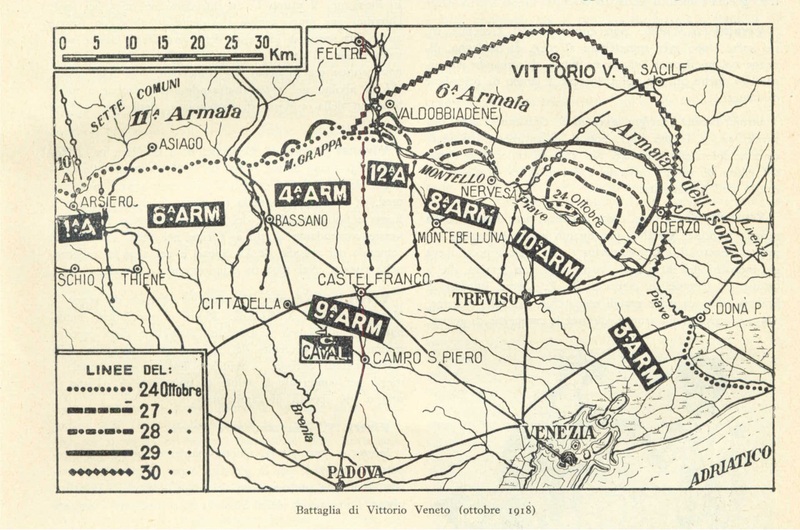 In accordance with Diaz‘s plan, other Italian units wheel to the north, threatening to outflank the Austro-Hungarian defenders of Monte Grappa. Thus far the Austro-Hungarian defenders here have held their positions against a series of Italian attacks, inflicting some 25,000 casualties on the enemy, but now they are in danger of being enveloped. After night falls they begin a retreat to the north. The Allied victories in Palestine and Syria have brought them to borders of Anatolia. Rather than face invasion of their heartland the Turks have requested an armistice, using Townshend (captured with his army at Kut in 1916) as a go-between. Now after four days of discussions Turkish negotiators agree an armistice with Britain’s Admiral Calthorpe onboard the Agamemnon, anchored in the harbour of the Lemnos port of Mudros. Under the terms of the armistice, the Turks are to demobilise their army, release all prisoners of war and hand over all warships to the Allies. German and Austro-Hungarian troops are given a month to depart from the Ottoman Empire. Constantinople is to come under Allied occupation and the Allies will be allowed to occupy other parts of the Ottoman Empire to “restore order”. The Turks are also obliged to withdraw their forces from Cilicia, a region that the French are interested in acquiring. 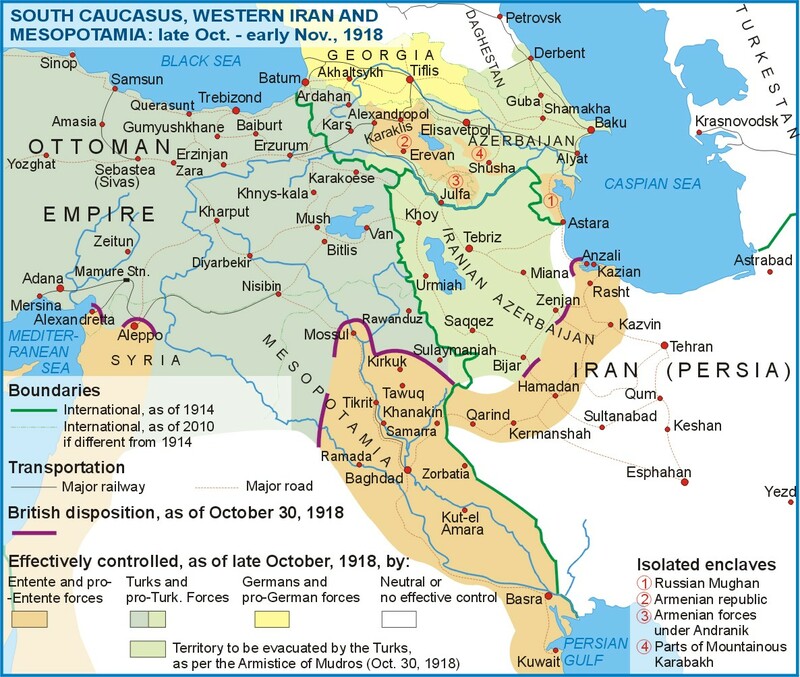 Turkish forces are to be withdrawn from the Transcaucasian territories they conquered after the collapse of Russian power there. The armistice specifically authorises the Allies to occupy the Armenian areas of eastern Anatolia in the event of disorder. The Turks are also required to release any Armenian prisoners, a sign of Allied intentions to hold accountable those responsible for the Turkish regime’s crimes against them. The armistice will come into effect tomorrow. The collapse of Austro-Hungarian forces in the field has convinced the various peoples of the Empire that their future lies in independence. National committees have appeared across Austria-Hungary and are taking over powers that would previously have belonged to officials appointed from Vienna or Budapest. The local civil administrations are transferring their allegiance to these new bodies, leading in many cases to a surprisingly seamless transition. It is as though the Empire is just fading away. In Zagreb a national committee of Croats has taken over the local administration. Now it declares Croatia part of a new united nation of Serbs, Croats and Slovenes, to be colloquially known as Yugoslavia. With Serbian and Allied forces advancing up the Balkans the Austro-Hungarian authorities are in no position to block this new state’s emergence. Meanwhile in Hungary the situation is more tense. A power struggle has emerged in Budapest between the national committee of Károlyi and forces loyal to the Habsburg crown. Demonstrators have been killed by the security forces, but the tide is flowing towards the nationalists. Nationalism has made inroads into the city’s garrison and now Hungarian army officers are themselves joining the revolution. The city’s telephone exchange is taken over by rebel troops, leaving Lukachich, Budapest’s loyalist commander, isolated and unable to exercise any control over events. After three years of failure the hour of victory appears at last to have arrived for the Italians. Their troops are now pouring across the Piave and pressing eastwards. The Austro-Hungarians attempt to make a stand on the Monticano but the Italian wave is too much for them. Lest the army be destroyed, Boroevic now calls for a unilateral withdrawal to the frontier. With Emperor Karl having already requested an armistice, Arz, the Austro-Hungarian commander, reluctantly agrees. The Austro-Hungarians begin their great retreat. Austria-Hungary is at breaking point, with the Empire’s cohesion being torn apart as the strains of war and the imminent defeat leave the central governments powerless in the face of local unrest. In Cracow the city council confiscates food supplies intended for the Austro-Hungarian army, determined that the needs of Polish people should come first. In Prague the Czechoslovak National Council declares itself the government of an independent Czechoslovakia; across Bohemia and Moravia officials who had previously served the Austrian government in Vienna now row in behind the new regime. Unrest continues in Budapest, where the authorities are struggling to contain nationalist supporters of Károlyi and his National Committee. Meanwhile the military situation remains dire, with every indication that the Italian advance across the Piave will lead to a complete rout of the Austro-Hungarian army. Seeing that the end has arrived, Emperor Karl now requests an unconditional armistice from the Italians. In Prague the news is greeted with jubilation. Crowds throng the street, shouting the names of President Wilson and Tomáš Masaryk, Czechoslovakia’s exiled leader.